Here it is, one of the saddest phrases in the English language: “Duncan Hines microwaveable mug cakes for one.” It plunges you deeper into darkness with each word, until the final salvo. Microwaveable mug cakes for one are a memento mori with rainbow sprinkles. Of course, I had to try one. The mug cakes began appearing as a targeted ad in my Facebook feed not long ago, and instantly piqued my curiosity. Not because I really wanted to eat single-serving powdered cake, but because it seemed so terribly grim: the inferiority to conventionally baked cakes, the packaging that called it “decadent,” the utter loneliness of it all. The ads continued to appear, and that’s when the shadows set in: What did it say about me that Facebook thought I should be seeing ads for microwaveable mug cakes for one? It’s probably because I am a thirty-something white woman who eats occasional junk food (for WORK, it’s my JOB, stop judging me, Facebook) and clicks “like” on far too many videos of puppies and kittens. 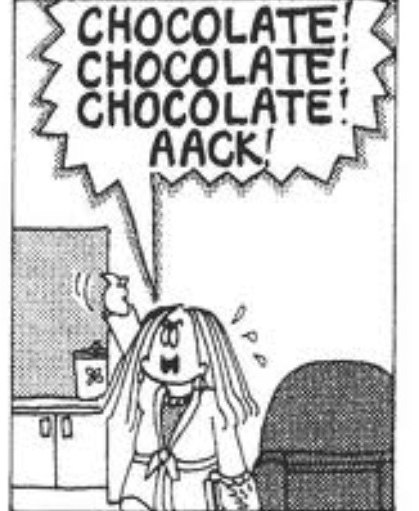 I’m guessing that somewhere in Facebook’s algorithmic nerve center, this tagged me as a living, breathing “Cathy” comic, which is what I imagine the target demographic for single-serving mug cakes to be. If a person were single and unhappy about it, these mug cakes could be their breaking point. Those recipes are sad, but they are at least recipes: Take a steak, add some other, fresh ingredients and nuke it to oblivion in the microwave until it’s ruined. While it’s devastating to destroy a good piece of meat like that, it’s somehow less existentially sad than opening a packet of chocolate powder, adding two tablespoons of water, and microwaving it on high for 55 seconds in a mug. Mug cakes have been a thing for a little while now. They’re popular with college students. You can make fancy ones from scratch, following recipes by the Pioneer Woman, or Country Living, or even country music star Trisha Yearwood. The Duncan Hines cakes come in a staggering 18 flavors, if you include the “sunrise” branded microwaveable mug muffins. You can microwave a German chocolate cake, a pineapple cake, even a “funtastic” s’mores cake. Each box comes with four single-serving envelopes of cake powder, to which you can add a few tablespoons of water — or cream if you’re feeling sassy — to make your batter. I made confetti cake with rainbow sprinkles and watched as it circled around on our office microwave’s tray. The batter puffed up like a marshmallow and then, as soon as the microwave turned off, deflated like a flat tire. It smelled like what a scented candle company thinks cake should taste like. It resembled cake only in that it had sugar and sprinkles: Texturally, it was strangely gummy, a quality that only worsened as it grew cold. It took a while to soak the gluey cake remnants off my mug. I had four bites, and contemplated my mortality, because death is like a microwaveable mug cake for one: Even if you’re surrounded by people, everyone must face it alone.